Summoned jurors are required to call the Automated Jury Information System (AJIS) at 1-866-560-4756, or log in to the eJuror system, to determine when they should report for service. When you call the toll-free number at the date and time designated on your summons, our automated jury information system (AJIS) will provide you with current information specific to your status such as the date, time, and location for you to report for your jury service or when you should call in again for further instructions. This same procedure will continue during the entire time you are summoned. Should any changes be made to the summons, every effort will be made to inform jurors as soon as possible. However, in the event that contact is not made, it is the juror’s responsibility to call the toll-free number the night before scheduled service to verify that his or her presence is required. You must have your 9-digit participation number from the front of your summons in order to use this system. Summoned jurors should not report to the courthouse without first calling 1-866-560-4756 or logging into eJuror. Please note that both AJIS and eJuror will require jurors to enter the 9-digit juror participant number found on the front of their summons. The Northern District of Florida is separated into four divisions, which may require jurors to travel to a courthouse some distance from one's home. 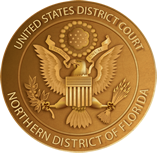 The courthouses of the Northern District of Florida are located in Gainesville, Panama City, Pensacola, and Tallahassee. Each courthouse serves the surrounding counties. Please note that due to heightened security at all federal courthouses, photo ID is required to enter the building. Please leave all metal objects and electronic equipment at home, including cellular telephones, electronic media devices, e-readers, laptops, cameras, pagers, recorders, knives, and other metal objects which will activate the metal detectors located at the courthouse. All visitors are prohibited from bringing liquids into the courthouse. Reading material is NOT allowed in the courtroom. If you have a disability that requires special accommodation, such as a hearing impairment that requires a sign language interpreter or a wheelchair restriction that requires ramp access, please contact the Jury Administrator at least two weeks prior to your reporting date so arrangements can be made. Persons are notified of jury duty by mail when they receive an official Summons to appear for a term of court. The summons mailing contains a pamphlet of jury duty information, directions to the courthouse, information regarding parking, and a juror information form which must be completed and returned to the court within five days, in the included pre-addressed envelope. Summoned jurors may complete their juror information online, using the eJuror system. Petit Jurors are summoned to serve on civil and criminal jury trials held in the District Court. A civil jury consists of six to twelve members. Criminal trials require twelve jurors with a minimum of one alternate. All juries are drawn on the first day you report. If you are not selected, your jury service will be over that day. If selected, a juror serves an average of three to five days during a term of court. Grand Jurors determine whether a person shall be tried for a serious federal crime alleged to have been committed. The grand jury convenes monthly for one to three days during the 18 month term of service. The sessions are held in secrecy to determine whether there is sufficient evidence to warrant a true bill of indictment. This is the initial stage of a criminal proceeding. All Federal jurors are paid $50.00 per day as an attendance fee and receive payment for round-trip mileage from their home address to the courthouse address each day that they serve. Mileage is at the current GSA-mandated rate for privately owned vehicles. Parking fees, tolls, and public transportation costs, if incurred, will also be reimbursed. United States government employees will not receive an attendance fee for jury service (U.S. Postal Service employees excepted). A check for attendance, mileage and subsistence, if any, will be mailed to your home address approximately three weeks after completion of jury service. If you have served as a juror in the Northern District of Florida and are awaiting payment, you may submit a juror payment inquiry to check on the status of your payment. After completion of your term of service, the Jury Staff will, upon request, provide you with an attendance certificate showing the dates you served. You can obtain the attendance certificate online, using the eJuror system. On occasion, a federal juror may be authorized to stay overnight while serving in the United States District Court. If it is necessary to spend the night. a subsistence fee will be paid to jurors who live 60 miles or more from the courthouse. Authorization for overnight stays must be obtained in advance from the Office of the Clerk two weeks prior to reporting. Authorization will be granted on a case-by-case basis. 2. You may spend nights in between consecutive days on which you are scheduled for jury service (e.g., You are selected today, you must return tomorrow. - You may spend tonight and receive the subsistence allowance rate that applies to you). 3. You may not spend the night after jury service ends unless extraordinary circumstances exist which must be approved prior to your stay. 4. Subsistence allowances are set by Washington, D.C. and are specific to the city to which you are reporting. Please contact the Jury Staff where your jury service is to take place for the specific amount of your subsistence allowance. We do not require itemized expenses. We do require proof that you spent the night in the city (e.g., hotel bill and receipts for meals). You may request authorization for an overnight stay by calling the Jury Staff or by using our online form. A juror who fails to report as directed can be ordered to appear before the court to show cause for his/her failure to comply with the summons. Any person who fails to appear pursuant to such order or who fails to show good cause for noncompliance with the summons under the Jury Selection Act (18 U.S.C. 1866(g)) may be fined not more than $1,000, imprisoned not more than three days, ordered to perform community service, or any combination thereof. Federal jurors are protected against discharge or coercion by employers as a result of being called for jury duty. District courts have jurisdiction of these civil actions. A mechanism is provided for the appointment and compensation of counsel for jurors claiming violation by their employers and whose claims are found to have probable merit. Cut back the work hours, change work assignments or conditions and/or discharge an employee serving on jury duty because his absences upset the employer. Appropriate dress, casual business attire, is required. Shorts, jeans and t-shirts are not considered appropriate. Our courtrooms are generally very cool and you may wish to bring a sweater or light jacket. Since you will be passing through a metal detector, please leave excess metal and jewelry at home to speed up your entry into the building. Prior to arriving at the courthouse, jurors should familiarize themselves with proper juror conduct and courtroom etiquette. Jurors are expected to conduct themselves with reserve and courtesy. If your jury service will result in undue hardship or extreme inconvenience, you should notify the court in writing. Be sure you include in your notice the reasons why you cannot serve, and indicate when you would be able to serve. You can send your request to the Jury Administrator by U.S. mail, fax it to (850) 521-3677, or email it using the hardship request form. Having custody of, and actively caring for, a child or children under 10 years of age, and not working outside of the home.